In our new book ACSM’s Body Composition Assessment we look at a vast array of composition tests. In this article, we look at the DXA body composition test. What is DXA body composition? The dual-energy X-ray absorptiometry (DXA) is a body composition test. It’s a fast, relatively noninvasive technique that can measure bone density for the diagnosis of osteoporosis, whole-body composition and regional composition. It is sometimes called DEXA. Briefly, this method utilises an X-ray beam consisting of two energies that are passed through the human body. The two energies pass through soft tissue and bone at different rates, depending on the composition of the tissue. This is done while a person lies supine on the table of the instrument. There is lower invasiveness or discomfort involved compared with densitometry from hydrostatic weighing and air displacement plethysmography (ADP). The DXA has lower variability compared to using skinfolds. DXA also tracks lean bone mineral during weight loss to give better estimates of the composition of weight loss. In general, the DXA body composition test shows excellent precision (coefficients of variation of 1%-3%) and good accuracy (between 2% and 3% fat standard error of estimate [SEE] in multicomponent models for the measurement of body composition, which makes it a desired laboratory technique). DXA’s ability to measure total bone mass allows it to be used in multicomponent models to avoid the assumption that bone mass and density values are constant components of fat-free mass (FFM). Unfortunately, in the Western world many of us are overweight (62% of adults in England are classified as overweight). Especially in overweight and obese individuals, the choice of body composition methodology is critical. Body composition testing in this situation is best done using DXA. This is because of the low invasiveness and discomfort involved. DXA also tracks lean bone mineral during weight loss to give better estimates of the composition of weight loss. Newer techniques, such as ultrasound in the obese, may yield more accuracy. Simple field methods are also informative (e.g., waist-to-hip ratio and waist circumference). We are also an ageing population. Older individuals tend to lose lean mass and gain fat mass while maintaining their body weight, a condition called sarcopenia. A DXA scan can measure soft tissue lean mass, both whole body and regional, from a total body scan. So in the elderly, it will indicate body composition changes as well as exactly where on the body these changes are occurring. DXA is of great value to the ageing population as it can provide early diagnostics for osteopenia and osteoporosis. DXA’s ability to detect changes in composition over time has shown promising results with small mean differences between percent fat changes measured by DXA and multicomponent models. Houtkooper et al. found DXA to be a sensitive method for assessing small changes in body composition over 1 year in both exercise-training and no exercise–training groups. Tylavsky et al. compared two different DXA systems (fan beam and pencil beam) and found both approaches estimated lean soft tissue changes reasonably well. In several studies, a considerable individual variation in measuring change was found. In general, DXA’s ability to accurately measure body composition is comparable to or better than other two-component laboratory methods (densitometry, TBW) because it is a three-component model. 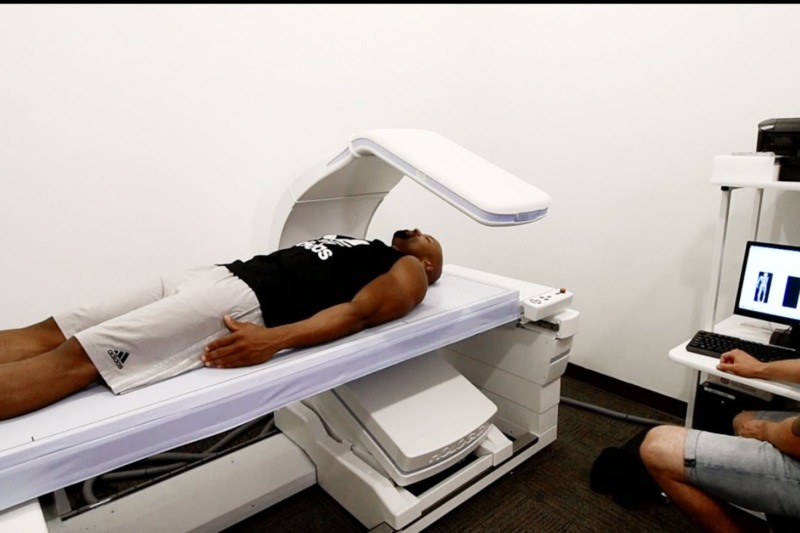 The DXA body composition test requires expensive equipment and highly trained specialists to read and interpret the results. This is not always available. Systematic differences exist among studies between the mean percent fat from DXA (using various hardware and software) versus the four-component model as well as in different populations under study. In general, these differences are between 1% and 2%; however, in highly lean or obese populations, a larger difference is often found. Given these limitations, DXA is classified as a laboratory method rather than as a reference method. Another limitation of the practical use of DXA is the size of the scanning area. Very tall and very broad individuals cannot get their whole body on the machine. Some manufacturers have begun to increase the area and weight limit of their instruments. Researchers have examined alternate scanning procedures to accommodate larger individuals. For more information on this check out: Techniques for Undertaking Dual-Energy X-Ray Absorptiometry Whole-Body Scans to Estimate Body Composition in Tall and/or Broad Subjects. Patients are scanned in minimal clothing. It is recommended that patients are scanned in a fasted state (12 h) and with an empty bladder. Patients are scanned with no prior exercise (~12 h). Best practice requires the patient to be in a supine position. Palms down, not touching the trunk, arms straight, legs straight, ankles strapped, feet in a neutral position and face up. Patients should be normally hydrated and not measured in a dehydrated state. DXA machines should be monitored with scanning phantoms. This helps to ensure proper operation and to detect any drift that may occur over time. The sum of lean soft tissue, fat and bone mineral should be compared to the measurement of total body weight by scale. These facts are taken from ACSM’s Body Composition Assessment. Nutrient restriction during pregnancy will reduce the nutrient supply of fetal myofiber number. This influences the amount and even type of muscle fibre that a person will maintain. Research indicates that maternal dietary restriction results in the fibre-type transition to offspring, generally favouring increased type I fibre expression. It is also important to note that reduced fetal skeletal muscle growth is not fully compensated for after birth because individuals who are born with low birth weight have lower muscle mass into adulthood. Larger birth weight and greater postnatal growth in the first 1 to 2 years of life have been associated with a higher lean body mass later in life. In addition, higher postnatal growth is associated with higher levels of obesity for the 2- and 3-year-old child. Thus, optimal prenatal nutrition will affect body composition and adult risk of obesity. Low birth weight (<2.5 kg [<5.5 lb]) is associated with lower lean body mass, fast catch-up growth and a higher risk of central obesity in adults. For this reason, adequate energy, protein, and micronutrient intake before and during pregnancy protect against adult obesity of the offspring. This means that women of child-bearing age who want to become pregnant or already are should be assessed so that weight gain is gradual, sufficient and not excessive. Monitoring indexes of fatness are critical during these years. Clearly, DXA body composition scans to assess body composition during pregnancy are contraindicated because of radiation exposure and possible harm to the fetus. Measuring body composition in childhood and youth provides for an estimation of risk for chronic disease. The research of Freedman and Sherry (22) and Freedman et al. demonstrate that skinfolds (triceps), body fatness (skinfold equations), DXA fat estimates and high levels of BMI at a given age estimate risk levels in children and youth of all ages. Freedman et al. use percentiles of BMI to assess risk. The authors found that risk factors are likely to be elevated for chronic disease at a BMI at or above the 95th percentile for age and gender. Going et al. (24), using the National Health and Nutrition Examination Survey (NHANES) III and IV for boys and girls 6 to 18 years of age, found 20% fat for boys and 30% fat for girls (based on skinfolds and the equation of Williams et al. ) to be predictors of chronic disease risk. Body Mass Index (BMI), or Quetelet index, is a measure of relative weight based on an individual’s mass and height. BMI is defined as the individual’s body mass divided by the square of their height. BMI = weight in kilograms/height in meters squared. It is one of the most popular field methods for estimates of overweight and obesity. Because calculation requires only height and weight, it is inexpensive and easy to use for clinicians and the general public. General guidelines for assessing overweight (BMI between 25 and 30) and obesity (BMI above 30) have been established. The use of BMI to assess obesity and health risks has been criticised in many scientific publications. This is because of its failure to account for body shape and inability to distinguish fat-mass from lean and bone mass. While the use of BMI is generally not recommended in assessing an individual’s body composition. This is especially believed to be the case for children or athletes. However, research in children and youth has shown that both BMI and skinfolds are useful in assessing cardiovascular risk. Thus, at present, BMI is widely used in assessing health-related fitness in children throughout the country in educational settings. Skinfold thickness measurement is one of the longest-standing and widely used approaches for estimating body fatness. This approach is based on the assumption that a fold of skin and the double layer of subcutaneous fat included in that fold are representative of overall body fatness. Because over 50% to 70% of body fat is located subcutaneously, this assumption has been shown to be valid using a combination of selected skinfold measurements. In general, several skinfold thicknesses can be used to estimate total percent body fat with a SEE in the range of 3% to 4% (good to fairly good). In fact, it’s what I’m using in my Linear Periodised Programme for Loading. Previous PostWhat is the LTAD model and should you be using it?